ADVENTURES IN The world’s most spectacular places with the world’s most fascinating people. UPCOMING ADVENTURES FOR ENTREPRENEURS: FIJI & BHUTAN. At Mastermind Adventures, we host carefully curated small-group adventures to bring together amazing, audacious entrepreneurs in spectacular settings. We help you envision and live a bigger future. We start with booking out incredible venues in spectacular places and the right people (carefully curated). Then we mix in challenging adventures, incredible meals, and lots of learning and connecting opportunities so you can push your limits, forge deep connections with other entrepreneurs, and build your knowledge base and tribe. Adventures bring people together in fun settings. Challenge forces you to confront and push your limits, and encourage self-growth. Every MMA experience has a healthy dose of both. The heart of an MMA experience is connection. From adventures, to meals, to fireside chats, to downtime, there are myriad opportunities to connect on a deep level with your fellow entrepreneurs. During an MMA experience there are multiple opportunities for learning. From curated forums to informal hot tub chats, you'll have plenty of opportunities to learn from others and share your own wisdom. 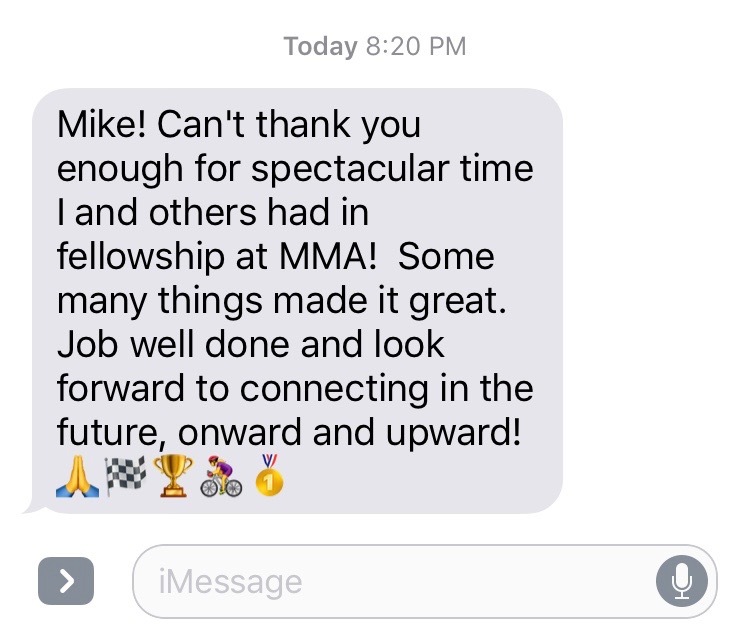 SMALL GROUPS: no more than 30 people attend an MMA event, so you get to go deep with a small group of amazing people, rather than wide and shallow with a lot of people. DEEP CONNECTIONS: When you're out there sweating with each other and helping each other overcome challenges (in super-cool ways - not cheesy team-building), you'll connect on a way deeper level than in a conference room. BREAKING THROUGH PERSONAL LIMITS: Our activities are designed to push you (safely) out of your comfort zone and help you overcome your own limiting beliefs about your capabilities. LIVING THE GOOD LIFE: At MMA events, you likely won't find many content sessions on 'Scaling to 8 figures in 30 days' or 'How to make $1M with Facebook Ads' - you can find that stuff online or at other conferences. What you will find at MMA are content sessions and deep conversations on how to live a good, meaningful, and optimized life as an entrepreneur - content and conversations about how to balance relationships with hustle; how to achieve peak mental clarity; how to build incredible company culture; or ways to find more meaning in your work. Who comes to a Mastermind Adventures event? Below are some of the beliefs our tribe shares - they describe a typical MMAer. 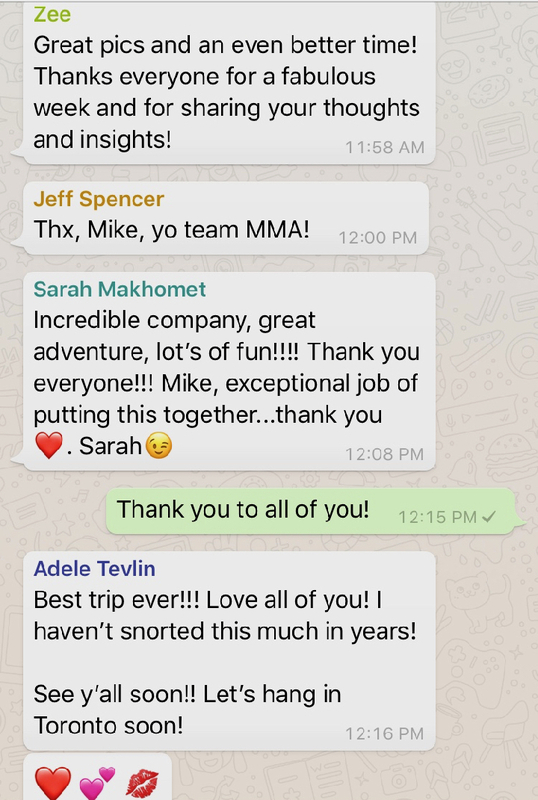 With a Net Promoter Score of 85 and a 92.3% 'Extremely Satisfied' rating, Mastermind Adventures events are rated extremely highly by participants. Nevertheless, we continue to act on participant feedback to continually improve our events!